On Thursday, Labour peer Lord Peter Hain of Neath tabled a question in the British House of Lords asking Chancellor of the Exchequer, Philip Hammond, to ensure that UK law enforcement agencies, including the Serious Fraud Office, investigate HBSC, Standard Chartered and Baroda Banks for possibly acting as conduits for the allegedly corrupt proceeds amassed by the Gupta family in their business dealings in South Africa. Hain has listed 27 individuals including 11 members of the Gupta family and their associates as well as President Jacob Zuma and 11 members of his family. By MARIANNE THAMM. On 25 September Hain wrote to Hammond as well as European Commission President, Jean-Claude Juncker, detailing corruption in South Africa “on an industrial scale” and highlighting that these alleged crimes have been enabled by transnational money laundering and criminal networks that are not confined to South Africa. “It became clear to me during my visit [to South Africa] that this Gupta/Zuma criminal network is not localised to South Africa – indeed it has been enabled by a transnational money laundering network that these individuals have established, including bank accounts at global financial institutions,” wrote Hain to Hammond and Juncker. “Such is the extent of this criminal network that the South African state is indisputably regarded as having been ‘captured’ with corruption and cronyism plundering taxpayer resources on an industrial scale. In consequence, economic growth has plummeted, international investor confidence is rock bottom and state institutions have been hollowed out in this great country, totally betraying Nelson Mandela’s legacy and the values for which so many of us fought in the anti-apartheid struggle,” Hain added. Hammond replied to Hain on 30 September confirming that he had referred Hain’s letter to the country’s Financial Conduct Authority (FCA) as well as the National Crime Agency (NCA) and the Serious Fraud Office (SFO). “My officials have also been in touch with the UK High Commission in South Africa. The government takes allegations of corruption and money laundering extremely seriously and is committed to preventing the proceeds of corruption from entering the UK financial system,” Hammond said. Hammond added that the UK government had strengthened legislative frameworks through the Bribery Act, the new Criminal Finances Act and the revised Money Laundering regulations. “We have also established a public register of beneficial ownership information. The government recognises that tackling corruption requires collective international action by governments, business and civil society,” wrote Hammond. In his letters Hain pointed out that the alleged crimes were committed in South Africa, the UAE and Hong Kong through UK and European headquartered financial institutions. In both these jurisdictions, the UAE and Hong Kong, said Hain, two of the UK’s largest financial institutions, Standard Chartered and HSBC, have their biggest footprints. 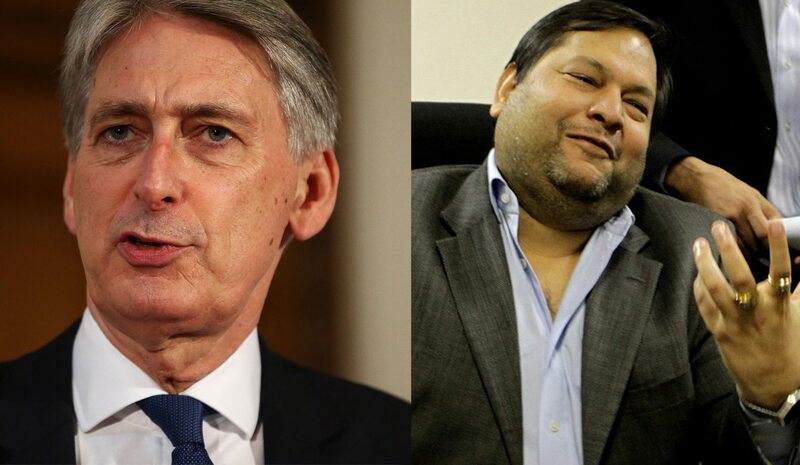 Hain told Hammond that #GuptaLeaks investigative reports detailed how several Standard Chartered US dollar accounts in Dubai “were used by the Gupta network to launder the proceeds of their illicit gains from the South African state. “Furthermore, several multinational companies, including McKinsey, SAP and KPMG, have recently been implicated in facilitating the Guptas’ financial crime activity. All three of these are facing multiple investigations. This follows a similar scandal involving the UK-based Bell Pottinger, which went into administration as a result,” said Hain. He said that the reach of the Guptas had not left Western countries untouched. Having spoken with South African experts as well as “highly respected” former South African Finance Minister Pravin Gordhan”, Hain said he had “deep concerns and questions around the complicity, whether witting or unwitting, of UK global financial institutions in the Gupta/Zuma transnational criminal network”. He requested Hammond and Juncker to ensure that UK and EU law enforcement and regulatory authorities investigate these allegations and to also request all EU-based financial institutions to review their exposure. He listed 11 members of the Gupta family, Gupta associate, Salim Essa, Eskom’s former CEO Brian Molefe, CFO Anoj Singh, Transnet’s Iqbal Sharma and Trillian’s Eric Wood. Also listed is President Jacob Zuma, his sons Edward, Duduzane and Mxolisi, daughter Duduzile, former wife and presidential hopeful Nkosazana Dlamini Zuma as well as current wives Bongi and Thobeka Zuma. Also on the list are Zuma’s nephew Khulubuse, Sikhumbuzo Zuma (a family spokesperson who is not related) and Truman Michael Zakhe Zuma. Hain asked Juncker to immediately get in touch with the authorities responsible for proper financial regulation in Dubai and Hong Kong to make enquiries “because I believe Banks coming under European Union jurisdiction will certainly be involved in money laundering as well”. On Thursday Hain asked whether the Chancellor would ensure that the British banks, together with European Banks, “track down” the laundered money in order to “return it to the South African Treasury”. He also asked that evidence be supplied to enable the prosecution of those implicated and connected in State Capture.